· Soak soya chunks into the hot water for 30 minutes. · Pressure cook soya chunks with salt , little water and keep it aside. · Meanwhile roast the coconut, 2 tbsp onion, whole black pepper, garlic until coconut become brown in color. · Finally add coriander powder, red chilli powder, chicken masala powder and roast for 1-2 minutes. · Grind the above roasted coconut mixture with water and make a smooth paste. · Heat oil in a pan and add onion and sauté till onion become transparent. · Add the tomato, sauté for 2-3 minutes, and then add the potato cubes. · Finally add the cooked soya chunks and close the lid, cook it for 5-10 minutes. 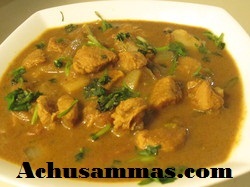 Very interesting curry.. Looks delicious! very nice!!! !i love the coconut milk in savoury dishes....it makes everything so very tasty...nice prep. 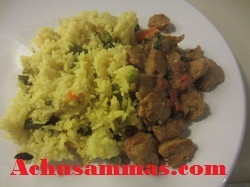 Definitely a super flavourful curry..Excellent side dish for pulaos. Nice curry and lovely colour of the gravy. The masala is so thick and nice. This is a wonderful curry. I am craving for something like this right now! I like the idea of adding soya chunks to it. Makes it more of an alternative and different dish. first time visitor to your space and its really awesome.. u have good collection.. glad to follow you.. do stop by mine sometime..
ya.this is perfect for vegetarians. Curry looks so delicious n yummy. Very new to your space Reena. At your free time do visit my blog.